The OMDC-125 Series variable speed DC Control is a cost efficient, reliable control for PM, shunt wound, and universal DC motors that incorporates up-to-date design and engineering into a compact package. Installation and field adjustments are facilitated using a barrier type terminal strip and large, easily adjustable trimpots. Adjustable horsepower range: 120 Vac; 1/8 to 1/2; 240 Vac; 1/25 to 1/4 and 1/4 to 1. 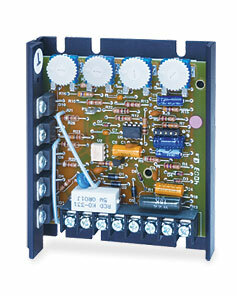 The OMDC-123DC model operates on low input voltage of 24/36 Vac with an output of 150 mA to 5.5 ADC. Note: Comes with operator manual and speed pot kit.